Senior Fifth is a very dangerous activity in which some upperclass students have participated in the past. It involves students attempting to drink an entire 750 ml bottle (fifth) of liquor the day of the last home football game before kickoff (this year 11/17/18 vs. Pitt). This unfortunate activity is not unique to Wake Forest. We have a prevention campaign that seeks to foster a campus culture that questions assumptions that this activity is safe or universally accepted and offers those who wish to decline participation support and language with which to resist peer pressure. 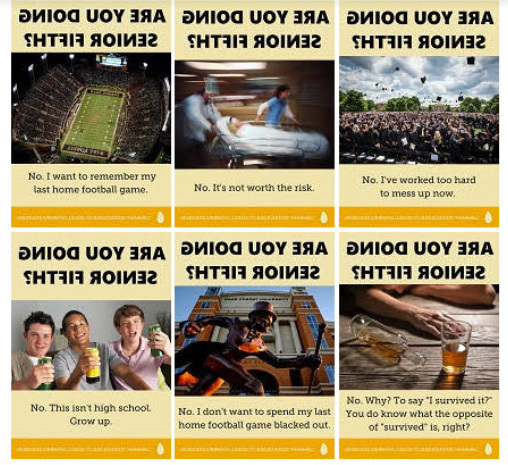 Prevention campaign posters specifically invoke the risk associated with alcohol poisoning, the nostalgia that upperclassmen students feel about their time spent at Wake Forest University, the conflict between high-risk drinking and achievement, and research on Self Perception of Adulthood (SPOA). This poster campaign is just one piece of a multi-faceted prevention program aimed at reducing high-risk drinking among Wake Forest University students. Students are seeing these posters on digital screens and printed posters around campus in areas strategically chosen to be seen by upperclass students. Peter says that the primary goal with this campaign is to stimulate discussion about Senior Fifth, to raise questions about the compatibility of Senior Fifth with safety, maturity and academic success, and to give those feeling pressure to participate language with which to push back. While these recent outcomes are encouraging, Peter stresses that we still have a long way to go. The level of harm associated with this practice is still unacceptably high and it will take years to extinguish the culture that propels student participation in this activity. This year, the noon kickoff presents an added challenge. For the past 3 years, the kickoff time has been 7:00 pm. Now that the kickoff is 7 hours earlier, that could create an elevated risk for any students attempting to consume this much alcohol in such a short period of time. There is a delicate line that we walk every year with Senior Fifth. Some students feel like they are being lectured to if the administration talks to parents and families about the event. 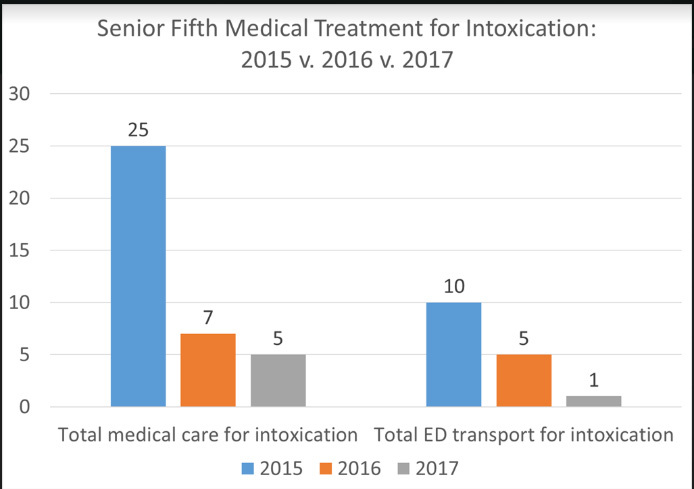 Only you will know if, when, and/or how it might be appropriate to talk to your student about Senior Fifth and high risk drinking behaviors. Whether you choose to talk to your student about Senior Fifth or not, remember that research shows that just calling them and talking to them on a Friday can significantly reduce risky behaviors. Of all weeks, this Friday and next Friday might be two of the best to call and check in.